Two years after the first game, we're back on the battlefield, still with a mission to stop the evil General Morden. This one once again wishes to conquer the world, but this time he will be helped by a kind of Egyptian sultan with his fighters. These will capitulate quickly, once you destroy one of their aircrafts armed with super ultra hot reactor. Marco and Tarma are always available to play, and SNK added the two charming girls Fio and Eri. You will be able to switch characters during the game after each credit used. 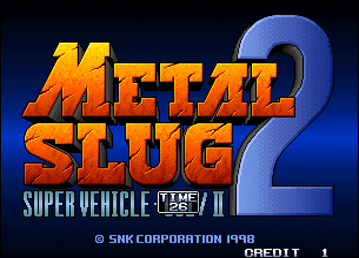 Metal Slug 2 offers a lot of innovations, particularly in terms of weapons: Laser Gun, Rocket Launcher, Drop Shot, Iron Lizard, Enemy Chaser, Super Grenade... But new vehicles are also available: Slugnoid, Camel Slug and Slug Flyer. A somewhat unusual hostage will help you fighting enemies by launching fireballs: this is Hyakutaro Ichimonji! In this episode, there are many extras including food that will have you become fat. You will be slower to move and to shoot, but much more powerful with your weapons. Anyway, you'll still have to be careful not to be touched, otherwise your stomach will explode! In one of the stages, you will explore a pyramid, where mummies and bats will not let you break. Well, the bats are rather harmless but mummies are far more annoying... You will need to be careful not to enter in contact with their fetid breath, otherwise you'll be mummified... and once mummified, you are much slower! So there's no choice left, you must quickly find an antidote! When you're in the sewers, you will be facing with a multitude of monsters looking like the Lickers from Resident Evil 2. Do you remember these monsters that move over and that are very fast? Well here, it is the same: it will take you to kill them or avoid them, before they get all red and explode on you. You will also have another meeting with your friend Allen, always armed with his big gun. And you will also deal with the "Mars People" that began to invade the Earth. They apparently made a pact with the army of Morden. In a word, Metal Slug 2: it's good! We should still report a small problem: there are many slowdowns in the game - especially when playing two - which will be fixed in the next episode, Metal Slug X. The following stages are all new, beautiful, and downright excellent! The tour around the world continues, and let's say that you should be surprised the first time you'll play these. The last levels are very long and filled with enemies! 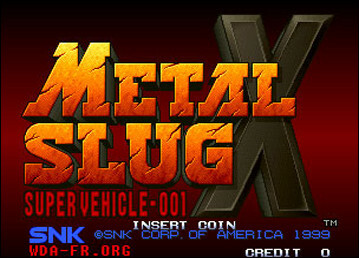 Metal Slug X, released in 1999 on Neo Geo MVS & AES, is actually a remake of the second episode, using some bosses from the first one. I'm not going to repeat the same speech for the 2, it would be useless since it is practically the same game! We can still notice some changes, especially during the first level where the action takes place by night, whereas Slug 2's same passage is happening in daylight; some bosses appearing at certain times, arms placed at different locations in various stages, full of new prisoners and hidden bonuses... Several small details like this make this X slightly different from episode 2. The following levels are the same as Metal Slug 2, except for some Bosses and other details... This being said, the game is also packed with a lot of new bonuses that will help you reach huge scores. Don't miss this one! 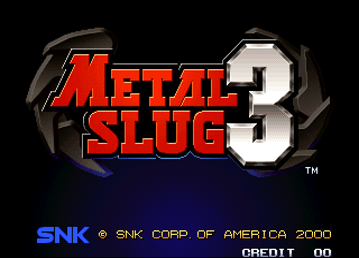 Released only one year after the X, Metal Slug 3 is the latest installment made by SNK before its acquisition by Playmore. SNK designed with this one the most incredible episode of the series. You are once again requested to defeat the army of General Morden. This album brings a lot of freshness to the series, including the ability to choose between multiple paths through the levels. Just make the right choice! New vehicles are available: the Slug Copter, Double-Jump Slug, Ostrich Slug, Slug Drill, Elephant Slug and Slug Submariner. A new weapon is also emerging: the Super Grenade (very powerful!). Some additional bonus weapons: You will be taken to release a special civil prisonerwearing a suit, who looks like he works for the government: he will provide you the Thunder Cloud (a cloud that fires lightning on enemies) which stands above the playing area. It'll just take to press the shoot button to put it in action, while you can keep shooting soldiers coming from front. You can also free a monkey in pants armed with an UZI, locked in a cage. He will help you by taking on your enemies when he wishes to... and he'll go away if you die. And a final bonus of mass destruction: the Mobile Satellite, which like the Thunder Cloud is positioned above your enemies, but this one shoots plasma rays. Side enemies, there's still the Morden soldiers, the Mars People and mummies, but we are also dealing here with a nice brand new bestiary.